Hello there! We have taken a close picture of the gold model from Apple and a custom 24K Gold finish from us to show the difference in color of the 2 finishes. Enjoy! CUSTOM 24K Gold Apple Watch SERIES 4! The newest Apple Watch SERIES 4 in any size (2018 release) is now available for Pre-Order on out website! Just place your order and we will get the watch, gold plate it and ship it to you! It only takes us 1 business day after we receive it to work on it and have it ready! We have been getting a lot of questions from customers asking if we will be gold plating the new iPhone Xs and Apple Watch with real gold and the answer is YES! We will be able to customize and electroplating both the iPhone Xs (Gold and Silver version) and the Apple Watch with REAL Yellow and Rose Gold! 24K Gold 42-44 Apple watch series 4!! We are very excited to share that we will be able to customized and gold plate the New 2018 Apple Watch Series 4 release! 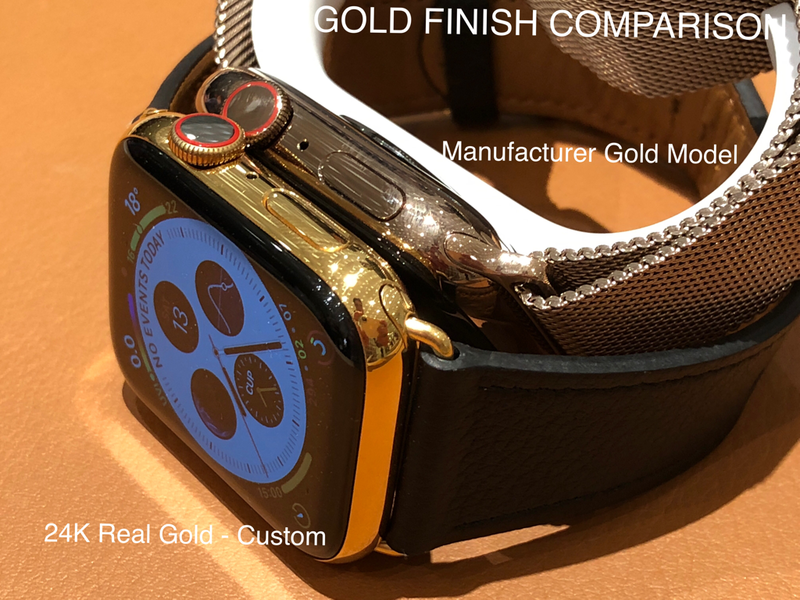 Considering the gold model they offer is more of a Bronze/Rose Goldish tone and that the stainless steel in the gold watch was only anodized we are happy to write that we will be able customize and Electroplate the device with Real Gold!! WE are EXCITED to introduce the new customized 24K gold samsung galaxy watch! We are very excited to share that as soon as the newest Samsung Watch comes out to the stores we would be able to customize the 42MM and 46MM sizes with 24K Gold. The smaller 42MM version would be customized and gold plated over every metal piece and the 46MM will also be gold plated but only where the current finish is silver stainless steel, keeping the black bezel as it is producing a more luxurious and stylish watch.